“I don’t need no bike that don’t need me!” Harley Mike proclaimed to a mixed-brand group of riders in response to someone asking why he would chose to ride a motorcycle that was so maintenance intensive. It appears Mike actually likes to work on bikes, unlike the rest of us at the table who only want to ride them. He gets satisfaction from taking it apart, inspecting the pieces and fixing or replacing what ever is necessary. For Harley Mike, that’s part of the joy of owning the machine. It would be easy to dismiss Mike as suffering from some kind of masochistic personality disorder. After all, he consistently votes for tax-and-spend politicians. Harley Davidson owns almost 30% of the American motorcycle market (about the same as Honda,) so there must be a lot of enthusiasts who enjoy working on their machines. It seems the more attention their motorcycles demand, the more their owners love them. Could it be that mankind has an inborn need to be needed? In this era of childless couples and pet-less singles, is that need being transferred to machines? Does this have an application for audiophiles? In heady discussions with fellow Barley Therapists, the consensus is that many audiophiles are much like Harley Mike. They enjoy messing with their equipment as much as utilizing it, particularly the analogue guys. To a Honda rider who only works on his bike when it quits, it’s painful to watch a vinylphile go through the seemingly endless ritual of extracting the album from the double sleeve, dry cleaning it, then wet cleaning it, de-sparking it with a plastic gun, de-fuzzing the stylus, resetting the VTA, etc. 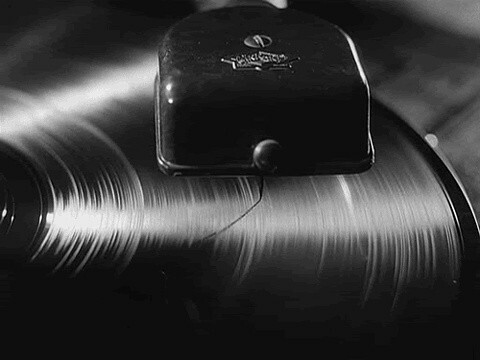 To the vinylphile, it is a cherished sacrament to insure a boundless harvest. Both the Harley rider and the vinylphile carry on about their product experiences in transcendental terms that are difficult to understand. To the non-believer, this talk is akin to theology or deficit spending. They know that in empirical terms, Hondas are superior in every way to Harleys; they accelerate and stop faster and they handle better. Likewise, digital audio has a wider dynamic range, deeper bass, flatter frequency response, lower harmonic distortion and a lower noise floor than analogue. So what is it about these Luddites that keeps them rooted in their anachronistic technology? The Harley guys will tell you they get more chicks, but there is more to it than that. In studies on the subject, the gentle loop of the Harley engine has been found to mimic the human heartbeat. Vinylphiles don’t get more chicks, they get more clicks. You can’t sleep with clicks, but as is the case with Harleys, there is more to it than that. I touched on it last month in my Newport Beach Audio Show review. In what my wife termed the Montanalogue Theorem, I hypothesized that the preference for analogue, at least in part, stems from its limited dynamic range. This allows the pre-amp to be turned up louder without disturbing the neighbors and therefore the quiet passages become more audible. The result is described by the vinylphile as superior resolution, greater realism, fatigue-free tonal lusciousness — anything except louder. But the claims of superior realism are not without merit. Large concert halls also limit dynamic range, albeit acoustically. So the in-your-face dynamics of close-miked recordings faithfully rendered by digital front ends on accurate equipment may actually be less like “live” than the analogue version, especially in small rooms. What else may account for the analogue preference? Because they produce deeper bass, large speakers tend to excite more room modes — which makes rooms sing at certain frequencies like a kid blowing across a soda bottle. The deeper the system’s bass response, the more likely it is to excite room modes. Digital front ends produce deeper bass than analogue. In addition, today’s speakers are capable of reproducing that bass, even those that aren’t particularly large. As a result, the problem of room modes has become endemic. Most of the listening rooms that I’ve measured belonging to members of the San Diego Music and Audio Guild exhibited bass peaks from 10 to 20 db. When I offered to correct them by electronic means, some shook their heads refusing to “mess up their sound” with anything that isn’t Harley approved. They’ve been brainwashed to believe that 20 db bass peaks are less problematic than “digital hash” from correction devices like those manufactured by Tact, Behringer or DSpeaker. For those folks, Rives makes an analogue equalizer which isn’t as versatile but still very effective. 1. Not a single owner raved about the improvement in bass. Some actually didn’t like the more linear response — so used were they to their bass hump. Yes, this included the guys with $60,000 systems. All that money spent for perfect sound and their systems exhibited more serious flaws than those lads who spent $3000 on a pair of stand mount monitors with generic electronics. 2. Once the bass hump was corrected, virtually all the owners were delighted with the improvement in mid-range resolution, even astonished! They had assumed the lack of clarity originated with their equipment. Some had repeatedly replaced equipment in an attempt to improve resolution. It didn’t occur to them that the bass hump created by the room was drowning out their mid-range. Once the root of the problem was revealed, they soon developed an interest in room correction and many bought some kind of DSP product. He just went out and bought a house with a sound room 5 times larger than his old one. So, as well as the satisfaction to be derived from cherished sacraments, an analogue front end presents at least two additional idiosyncrasies attractive to vinylphiles: It limits bass extension and therefore the likelihood of exciting room modes and it limits dynamic range: Both foster louder playback levels. As Dr. Floyd Toole discovered during his well documented speaker research studies for the National Research Council in Ottawa, louder is always perceived as superior. But there is no need to take Floyd’s word for it. Assim 'tá bem! uma casa maior e mai nada!!!!! Aqui está uma verdadeira suspresa. Penso que será um " labor intensive " diferente, será mais relacionado com upgrades e não com avarias. Também me junto ao aplauso!!! O texto permite de facto essa interpretação bem como outras de distintos pontos de vista. Not a single owner raved about the improvement in bass. Once the bass hump was corrected, virtually all the owners were delighted with the improvement in mid-range resolution, even astonished! It didn’t occur to them that the bass hump created by the room was drowning out their mid-range." Este tema da avaliação (observacionista, pela escuta) do desempenho de equipamentos e sistemas é algo que abordo recorrentemente porque me parece que a grande maioria dos audiófilos pratica o seu hobby com base numa premissa errada de que é possível obter um bom desempenho de forma intencional (e não por acidente) sem ter uma metodologia de avaliação adequada nem referências sólidas do som dos instrumentos e vozes ao vivo ou daquilo que é (e do que não é) possível obter em reprodução doméstica de música gravada...guiam-se pelo "gosto" (e muitas vezes estão descontentes com o resultado). Neste e nos outros fóruns de audio que frequento ou frequentei é vulgar deparar-mo-nos com pedidos de sugestão de equipamentos ou de ajuda para resolver problemas que muitas vezes nem sequer estão corretamente identificados, que resultam, por exemplo, de "colorações" (ou, como escreve o Kiyoaki Imai, de "vícios") que os audiófilos "aprenderam" a apreciar, de uma amplificação inadequada às colunas ou um mau posicionamento destas últimas na sala, e daí resulta a constante substituição de equipamentos que o autor do texto refere e que é uma perda de tempo e dinheiro pois só com muita sorte é que leva a bom porto.